One of a kind cabin with automatic slide out bedroom!! Sleep under the stars!!! This property is straight out of a magazine! Its a summer and winter paradise! Bring your boat or snowmobile because the property has lake access and is directly on the snowmobile trails! As you drive in, you'll notice the huge 120' tall pine trees, and the long driveway to your private cabin get away! Its the perfect retreat to just get away and spend some time with your loved ones. When you arrive, you will notice the craftsmanship put in to every corner of this property. Every detail was thoughtfully addressed and meticulously crafted, from the roll out bed that allows you to sleep under the stars, to the huge custom 7'x13' antique sash window. The ceilings reach 22 feet boasting a very open, yet cozy living area, and the kitchen is fit for a chef. Entertaining at the cabin is a blast! There is a custom made fire ring perfect for making s'mores and having a quiet evening by the fire. If you like music, you'll love the sound system controlled by your phone or tablet! Interior and exterior speakers allow you to hear your music anywhere on the property. The leather sofa is perfect for cuddling next to the gas fire or watching your favorite movie on the ultra HD TV. The living room also has a custom made dining table, custom made concrete coffee table, and 22 feet of glass separating you from the beautiful outdoors. The kitchen has a gas stainless steel range oven with a custom made vent hood made from an antique snowmobile hood. It is also fitted with a stainless fridge, soft close cabinet doors/drawers, and a fully stocked kitchen to excite your inner chef. The bathroom has frameless glass shower door, leather tiles, dry stacked stone accent wall, vessel sink with wall mount faucet, rusty metal ceiling and steel pipe hardware. The bedroom sits up in the loft. At night you'll climb up the spiral stairs to your luxurious bedroom. There you will find a king size bed with a 4" topper, extra soft sheets, down pillows, and a down comforter to make you think your sleeping in the clouds. At the foot of the bed there are 2 niches with fire bulbs to give the room a romantic fiery glow. Above the bed is a ceiling mounted TV that tilts to allow you to watch it even when the bed is outside. That's right! OUTSIDE! The bed will automatically roll outside at a touch of a button!!! You can now fall asleep with the cool night air and watch the falling stars while listening to the loons without leaving your bed!! Above that is the kids loft. A perfect spot for them to sleep and feel like they are in their very own tree fort. Morning coffee has never been better when you sit in one of our family made Adirondack chairs and sip your freshly ground and French pressed local coffee. You'll be able to feel the morning sun peeking through the trees and sweet smell of the giant pines. Once you've finished the worlds best coffee, you can take a ride to the lake access which is only 1/2 mile away. There you'll find a means to launch your boat and have an opportunity to meet the locals. Take your boat on a tour of the lake. There is a beautiful island and many bays. It is claimed to be one of the cleanest lakes in all of the Adirondacks. The lake is 1 mile wide,10 miles long, and feeds one of the best breweries in the world. Saranac, and Utica Club. In the winter months you'll be able to snowmobile from the door step! The entrance to over 3500 miles of perfectly groomed snowmobile trails start at your driveway!! There is always something to do. From canoeing, kayaking, boating, fishing, wake boarding, hiking, and mountain biking to snowmobiling, hunting, XC skiing, and snowboarding. There are beautiful mountainous winding scenic roads for motorcycling, thousands of miles of 4 wheeling trails, and unbelievable restaurants and bars. We guarantee that your stay will be something that you'll remember forever... That's why we built it. I was born and raised in the area and love all that it has to offer. I currently live in Connecticut with my wife and 2 kids as a building and remodeling contractor. Excellent convenient store across the street with everything you could ever need from fishing equipment and bait to home made food and beer. The cabin is set in the woods but close to everything you need. This is a gas fireplace that works on a thermostat however It can be turned on manually. Refrigerator is small so be careful if you shop for groceries before you see it. shouldn't need to bring anything but food. Canoe with 1 paddle, 2 fishing poles, 2 life vests. My wife and I enjoyed every moment at this cabin. It was such a beautifully decorated and well maintained cabin. Just the right size, with the right amenities. Can’t wait to stay again! My family and I enjoyed our stay very much! From the roll out bed to the kitchen and shower we were more than impressed! The owner was there for for any questions we had-with prompt responses! We will definitely be back to enjoy your cabin in the woods!! Thank you for sharing your beautiful cabin with us! The cabin was exactly as advertised and was a comfortable, quiet escape. Chris was very responsive and was helpful throughout the entire process. Will definitely recommend to friends! 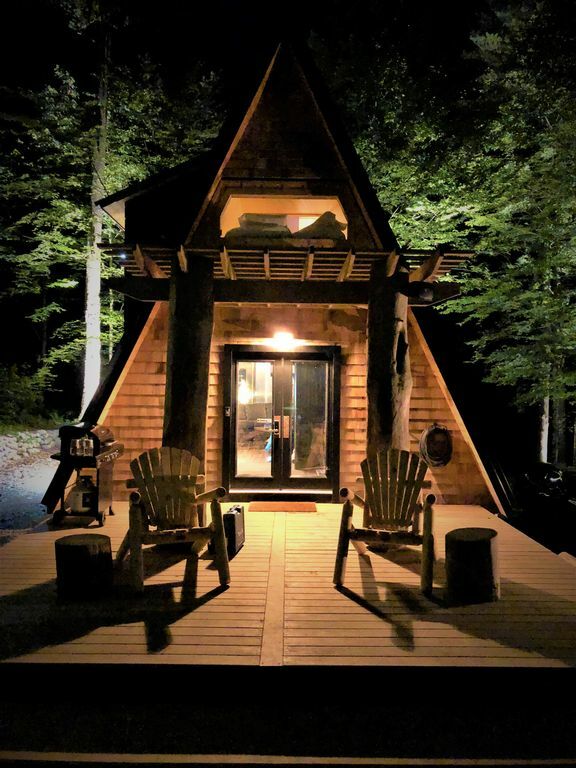 When you stay you are close to everything the Adirondacks have to offer. Old Forge is a great place to shop and spend a day. Hinckley Reservoir is claimed to be one of the cleasest in the Adirondacks. Great for fishing, and boating. The snowmobile trail starts right at your door step!!! 4 wheeling is minutes to drive to hundreds of miles of trails. Hiking and biking is about a 45 min drive.